10 Killed, Several Cars Vandalized and properties destroyed as Hausa/ Yoruba Clash in Lagos. More than than Ten persons have been feared dead and several cars vandalized on Thursday 3 of march 2015 in an inter-ethnic clash between Hausa and Yoruba traders at the popular Mile 2 area of Lagos. Scores of people with varying degrees of injuries. The clash lasted for hours before soldiers of the Nigerian Army and police personnel drawn from Rapid Response Squad (RRS) and Area H, restored peace to the area. 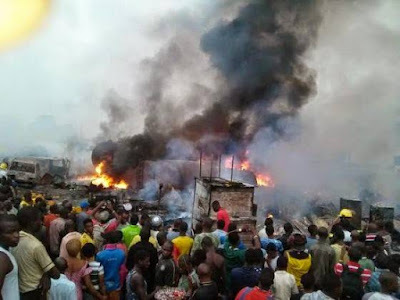 The fracas started off as a quarrel between Northerners and some Yoruba traders before it quickly escalated, claiming lives and properties, including the destruction of stalls and cars. For hours, the rampaging factions armed with dangerous and offensive weapons like guns, broken bottles, cutlasses wrecked havoc on the market, destroying and burning down stalls. The clash was said to have been caused by an Hausa motorcyclist who hit a female trader and attempted to flee to safety despite pressure by passers-by to take her to the hospital. should do so. The Okada rider was said to have reasoned that since the union was always quick to collect tolls from them, they should also take care of the hospital bills from accumulated tax. Angered by the standoffish attitude of the riders, an argument ensued and later led to a fight, after the Yoruba traders left only to regroup and come back. Having regrouped, they invaded the market, chanting war songs as they allegedly attacked the Hausa traders, who were mostly at the area where tomatoes, beans and pepper are sold. In the process, several stalls were burnt, while three Hausa traders were said to have been killed. As at press time, the Lagos State Commissioner of Police, Fatai Owoseni; RRS Commander, ACP Olatunji Disu and other senior police officers were at the scene to stem the tide. The army were deployed to the scene to assist the police to restore peace and as at press time, they had mopped up over 100 potential suspects. the meeting, said all the leaders agreed on the need to co-habit in peace irrespective of their religion, culture or tribes. arriving at a decision. But the killing is said to still continue as the Hausa'a are hell-bent of taking full revenge on the Yoruba's. envy, betrayal and anger, will always dwell amongst the forced ethnic groups in Nigeria. Biafrans haven been getting killed by the same Hausa-Fulani's for years. Millions of Biafrans have been killed in the process. Now this tribal-war between Hausa-Yoruba just shows that Nigeria will never ever succeed as a Nation, their is no love and unity, just hatred and Discrimination! Yes, nigeria cannot be one, as it has never been for over 102years of her creation by britain. Nothing binds the people. They are different in everything, religion, language, culture, Norms and Values, Traditions, food, clothing, just name only one thing that nigerians have in common. The truth is that there is not even one thing nigerians have in common. The amalgamation of the three nations, Arewa. Of the North, Biafra from the East and Oduduwa from the West to create the FRAUD, nigeria was by FORCE, and not mutually agreed. Since the amalgamation has EXPIRED, it better for nigeria to be desolved, divided immediately to avoid continuous killings and bloodshed, inclufing the destructions of both lived and properties. THE ZOO, NIGERIA CANNOT SND WILL NEVER BE ONE. Even if Nigeria is divided according to her Ethnic Linguistic Groups, if they do not have the love of Jesus Christ, the discrimination, hatred, envy, betrayal and anger, will always dwell amongst all the ethnic groups. The wickedness of human beings is not new on earth; it started right from the beginning of our world- "The LORD saw how great the wickedness of the human race had become on the earth, and that every inclination of the thoughts of the human heart was only evil all the time". (Genesis 6:5). The only hope for us all is embracing the love of Christ, and remembering that we are all visitors on this earth, that sooner or later we will give account of how we lived on earth. This is concretely illustrated on Matthew 25:14-30. Please read it. However, if you decide to apply your intellectual and philosophical reasoning and decide to not pay attention, you are not the first one who has done so. The creator knows that some human beings who are bound to perish will never embrace His life giving Word; that is why we read in the bible "14 But the natural man does not receive the things of the Spirit of God, for they are foolishness to him; nor can he know them, because they are spiritually discerned. Jeremiah 17:9 (KJV) tells us that "9 The heart is deceitful above all things, and desperately wicked: who can know it?" I said all the above to say that although it will be helpful to let Nigeria be divided as many as the groups that want to be on their own, if there are no laws that are actually enforced, according to the respect of human dignity and life, and people taught the reason to value both their lives and other peoples lives, we should not think that all the problems will be solved just by dividing the country.